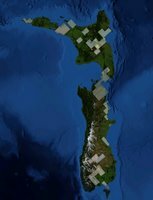 World Wind now has high resolution imagery for some parts of New Zealand, see the coverage map in this post. This imagery comes from LINZ and was processed by Nowak of World Wind Central on a cluster, paid for by donations from the World Wind community, running custom software written by Nowak. The Zoomit! layer was added to World Wind in version 1.3.4 by NASA, but the layer was created and is maintained by the community with no funding or other resources from NASA itself, and as the layer is a new network xml the data will automatically be available to all World Wind clients without any need for manually updating.